Tamsin Parker is a Level 6 student on the BA (Hons) Animation Production course at Arts University Bournemouth. 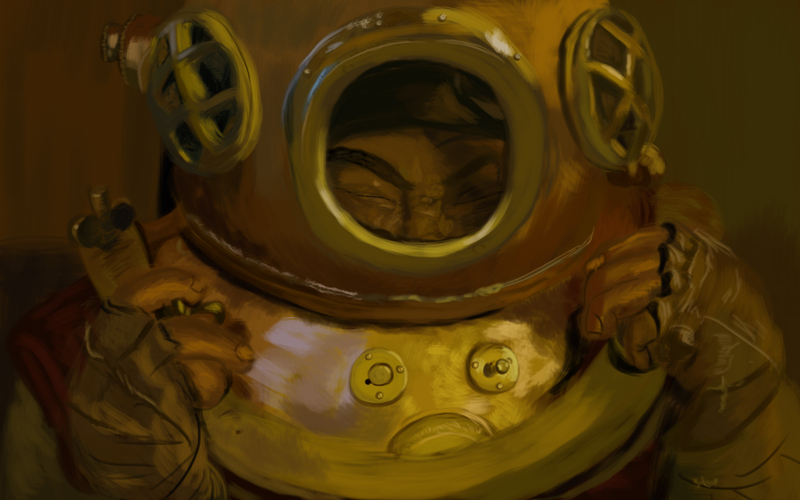 This is a digital fan art of Yoon Tae-goo, played by Song Kang-ho, from the 2008 movie “The Good, the Bad, the Weird”, pulling off a very heavy, very tight deep sea diving helmet after using it in a gunfight. I worked very hard on the digital painting in a place where I had no internet, and I tried to make it convincing that this guy was really straining trying to pull the bloomin’ thing off his head. I love Song Kang-ho as an actor and his performance in this film is my absolute favourite that he’s ever done. For more of her work check out her website and like her page on Facebook.